2013 had some rough spots. There was some burning of tail feathers, some amount of too many irons in the fire, and some questionable sanity & stress levels. During the last few months of the year, we decided to pare things down to bare minimum & lay low for a while. Re-prioritize. Our own little reset button. And it worked. Things are a bit more sane now. Whew. 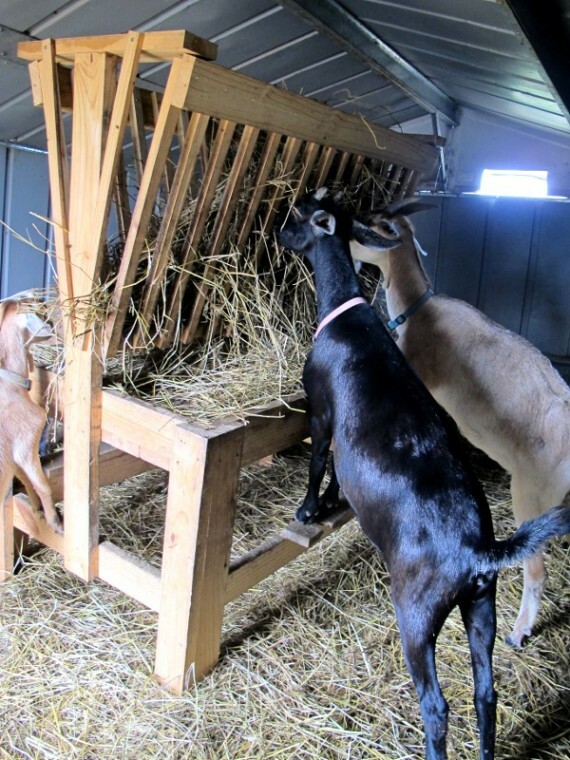 So the goats are all gone, which you probably guessed by my last posts on here last year. That’s certainly a relief. 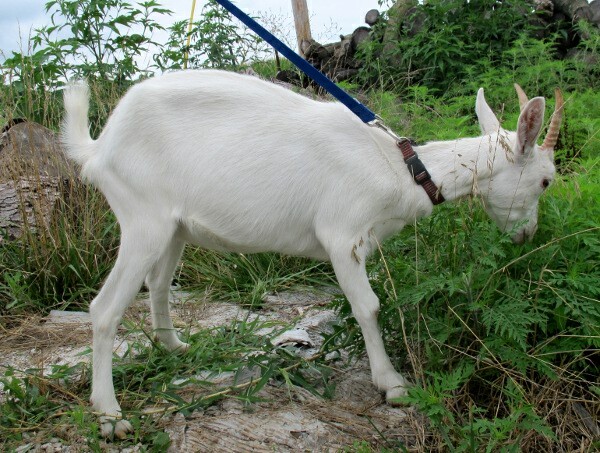 Goats are a lot of work, especially when we don’t live in an area that’s naturally healthy for goats. Too much upkeep and worrying. 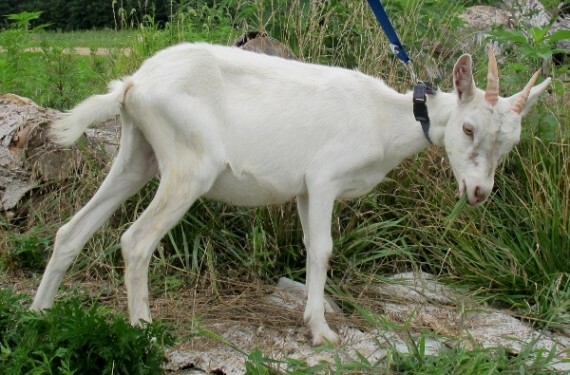 I like goats but I don’t like them enough to have to fret over them that much. You all know how lazy I am. Bottom line? 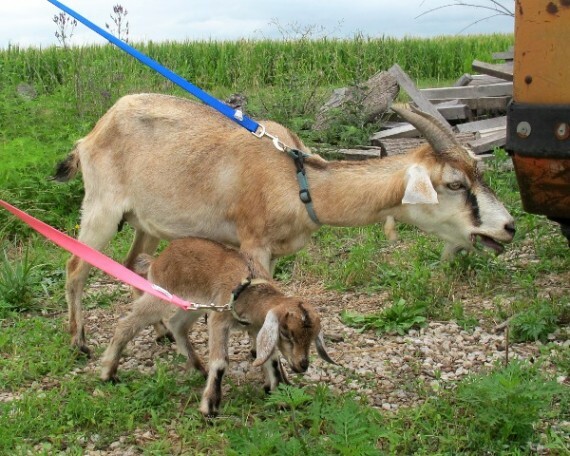 Goats = stress (for me). Bzzt. Gone. We are still considering a milk cow and a couple of young’ins for beef. It may or may not happen. Another change we’ve made it getting rid of poultry for meat. We are now concentrating on egg production, just using the culls for making stocks. We just don’t care for chicken meat that much but we use bone broth like crazy. We are still playing with turkeys, however. We loves us some gobble! Other than that? 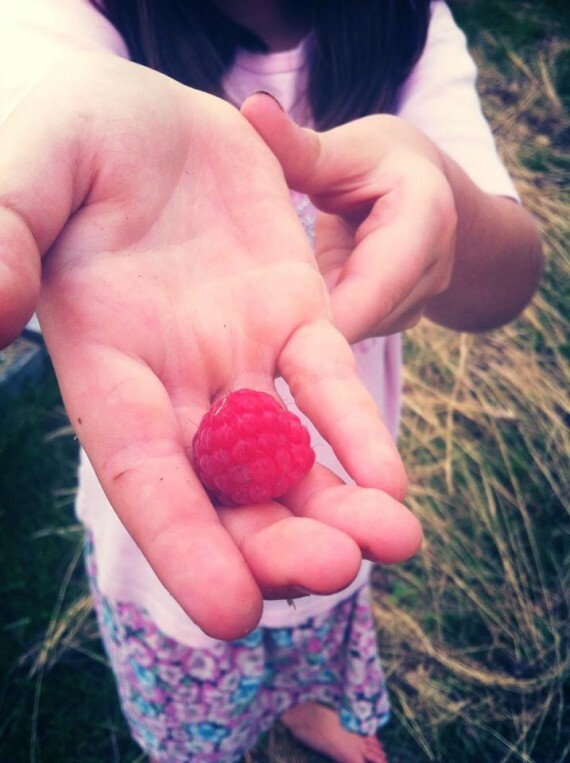 I, personally, am refocusing on what I truly and forevermore am crazy about: gardening. I’ve never stopped gardening but other things have distracted me along the way, diverting & dividing my attention and energy. Now that we’ve thinned things down around here, I can get back to it, full speed ahead. I am stupidly excited this year to renew my landrace projects AND get the greenhouse built. We poured concrete for it last fall and are beginning the framing this week. More on both coming soon. You can bet there will be pics! 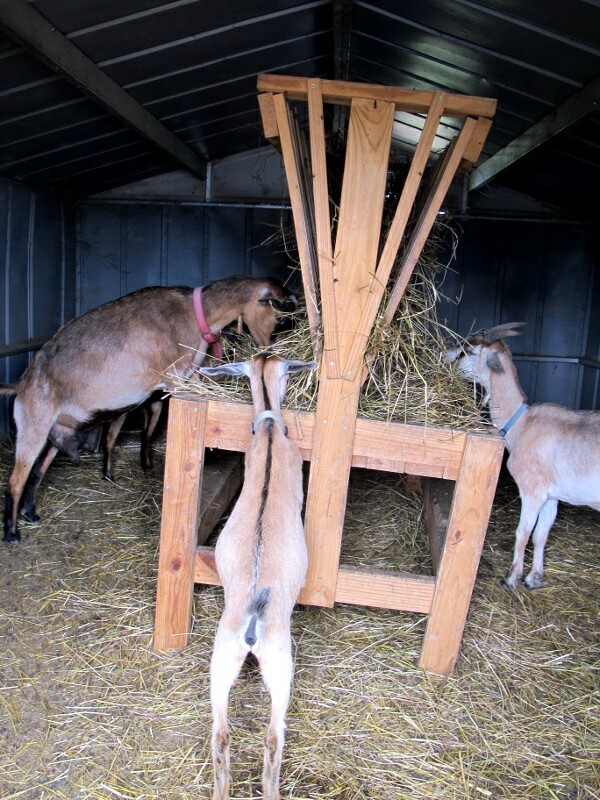 To follow up on my “Goats for Sale” post, here are the photos of the milk stand and hay feeder. They are for sale, $75 each. Steve designed and built them both. They’re very sturdy and have been kept out of the the weather. This is 60″ front to back, 67″ floor to tippy-top of the head closure slats, 31″ wide (side-to-side), and 21″ from floor to deck. The head closure slats are held closed with two long galvanized bolts. 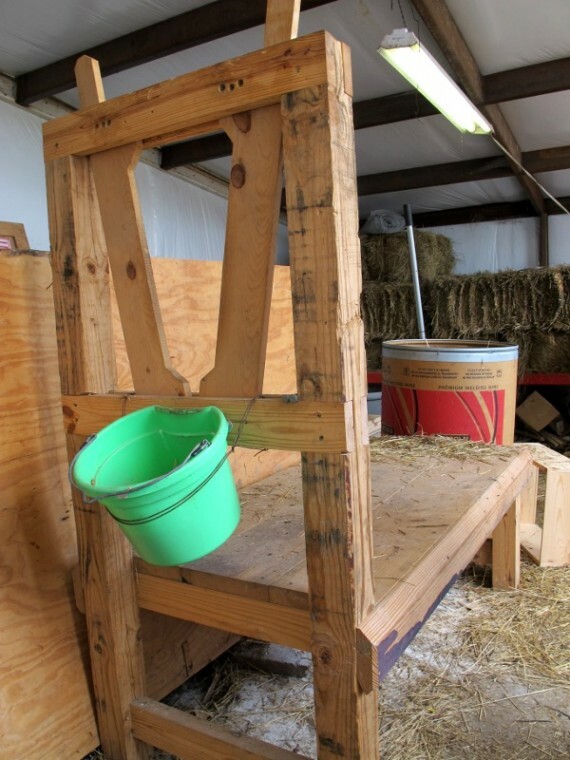 Feed is held in a bucket which is, in turn, held by a wired ring. Personally, we liked that better than the usual “tray” feeder because we could take it out and clean it easily. If you prefer a tray style, you could add one quite easily. We used this stand for everything from small Kinders to large Saanens. It’s extra wide because I preferred to sit along side the goats on the deck with my legs up while milking, as opposed to using a stool beside the stand. 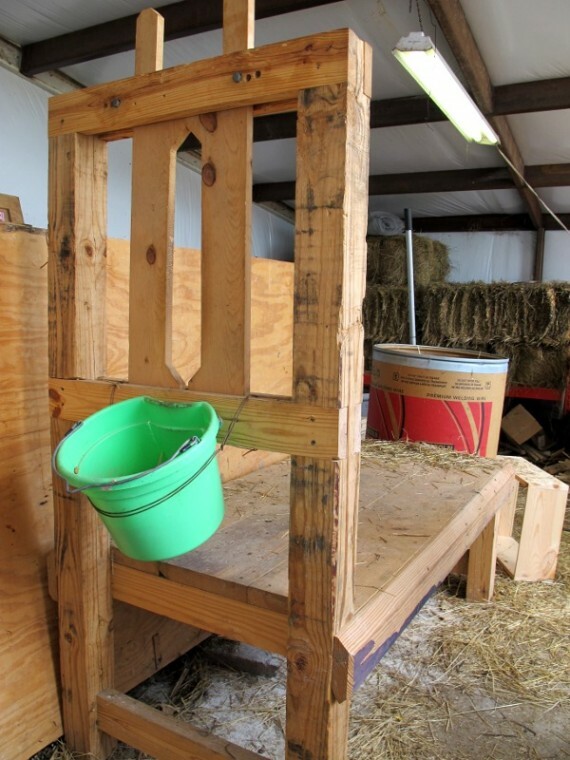 The hay feeder has a catch-tray underneath the slotted holder. This eliminates a lot of waste, what would otherwise end up on the floor to be soiled. Each side has a “step” for the goats. This stepping-up keeps the goats from a lot of their usual dragging out of piles of hay to the ground to picked through. 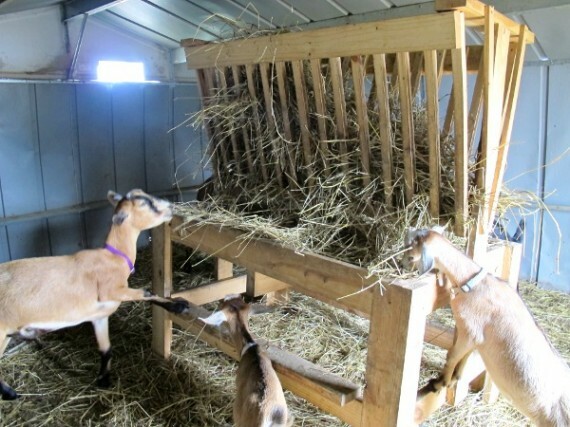 The step also allows even the young kids to reach the hay. (The smaller kids all seem to really enjoy the little hidey-hole underneath the feeder.) 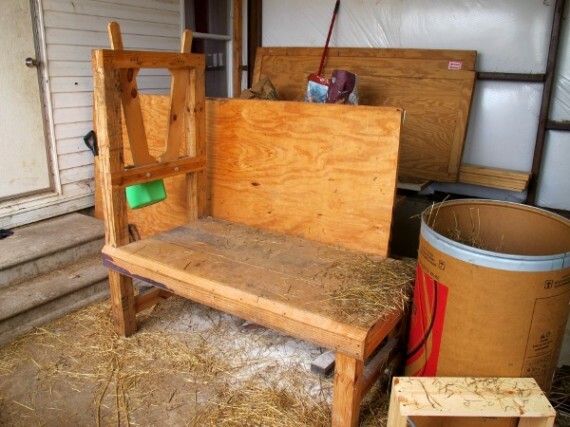 This measure 15″ from floor to step, 28″ from floor to catch tray, 55″ from floor to very top of hay rack, and 48.5″ wide at the widest part (the tray). 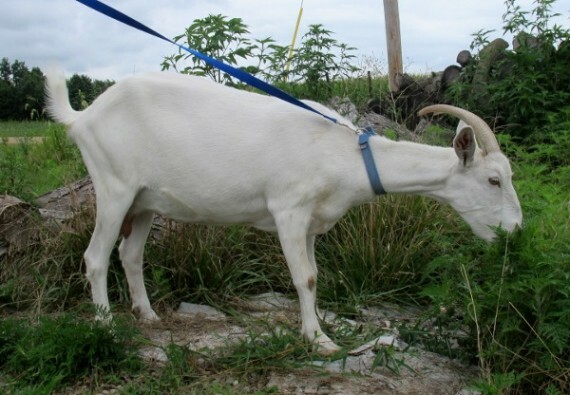 For those who don’t already know, we’re selling off all of our goats. I’m posting their pics & descriptions here so that I can just point interested parties here. I will cut deals for folks who buy several! This is Susie, a full but unregistered Kinder doe, of unknown age but probably 4-5 years old. She threw quads this spring and is a fantastic mom. Her teats are uneven but she milks out very easily. She’s trained to the milkstand and has a quirky personality. She is shown with her two remaining bucklings, Snowman and Brownzai, both full Kinders, born May 8th, 2013, father was a full registered Kinder. Susie and her bucklings are all disbudded. 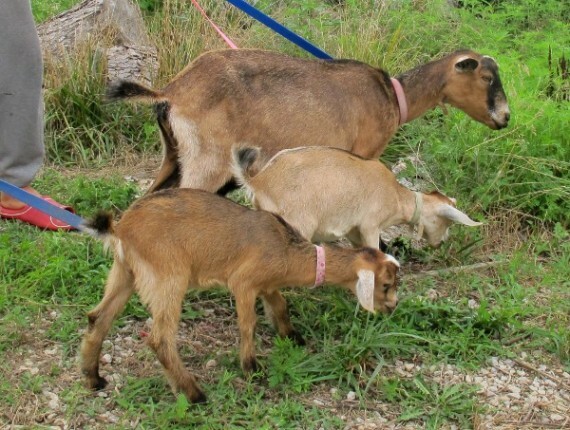 Susie – $75; bucklings – $50 each. This is Maisy, a full but unregistered Kinder doe, daughter of Susie, born December 2010. She had twins this spring (her second freshening) and is a great mom. She is trained to the milkstand. 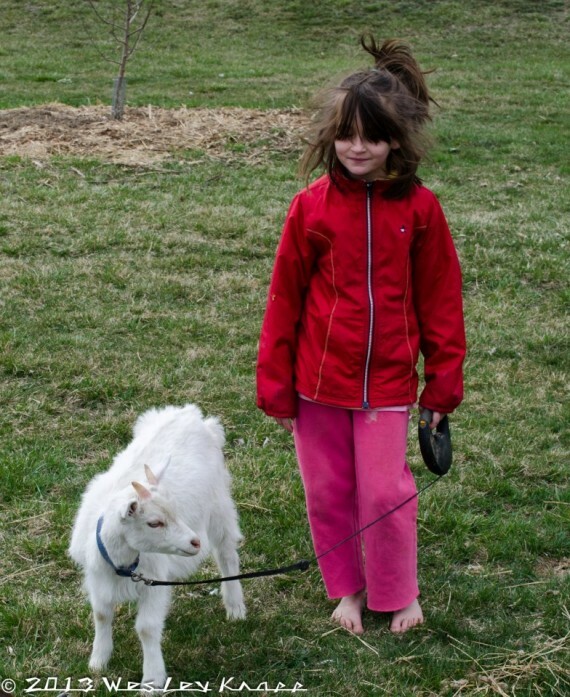 Shown with her are her buckling and doeling, born June 1, 2012, father was a full registered Kinder. None of the three are disbudded. 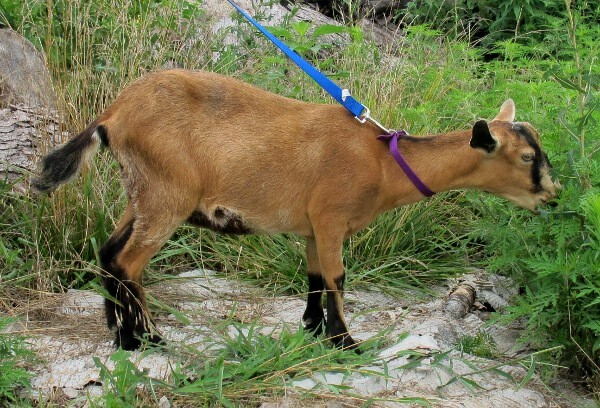 Maisy – $75; doeling – $50; buckling – $25. This is Missy, a full but unregistered Kinder doe, daughter of Susie, born in December 2011. She kidded for the first time this summer to twins and is a good mom. She is not yet trained to the milkstand but should prove to be easy. (She did not kid until July and, due to life, I just never started milking her.) Shown also is her remaining doeling, born July 9, 2013, father a full registered Kinder. Neither are disbudded. 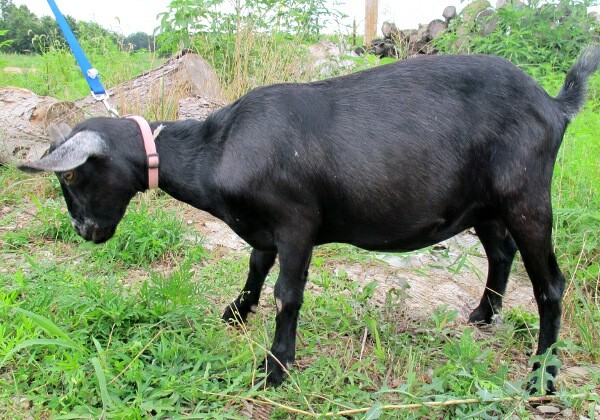 Missy – $75; doeling – $50. 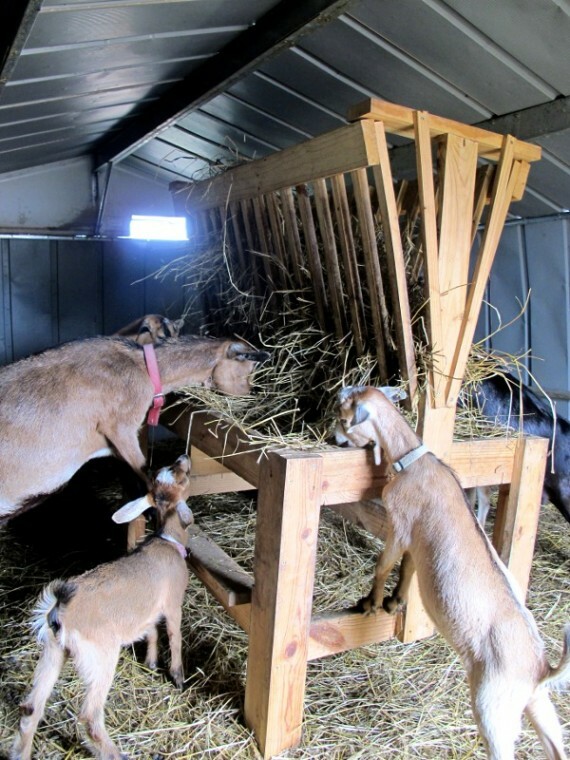 We also have a hay feeder and a milkstand for sale. $75 each. My husband built these and they are very sturdy! Forgot to take pics so will add them in later. Some local friends gave us four baby peach trees the other day. 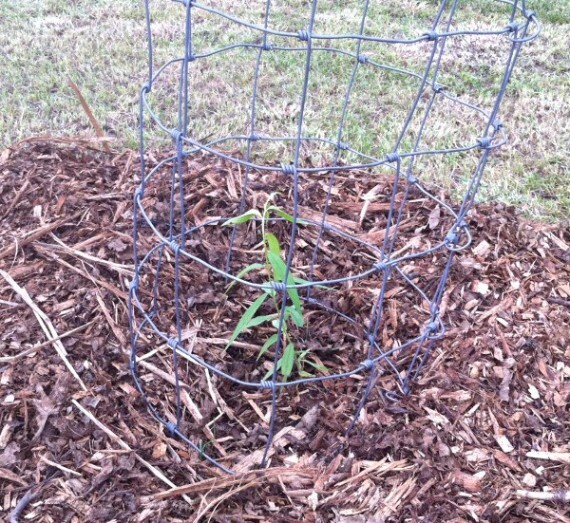 I got them planted, mulched, and caged promptly. Here’s hoping they do well (and I don’t manage to kill them)! Before much longer, the entire side yard will be an orchard and I can’t wait! The cucumbers I planted a couple of weeks back mostly rotted since we had Noah’s flood #2 directly after that. I replanted them yesterday, along with 100′ of summer squash — a mixture of Black Beauty, Grey, and Yellow Crookneck. The strawberries are still coming in nicely and the raspberries have just begun to ripen. The young fruit trees in the side and front yards have a goodly amount of fruit on them for how young they are. Some have just turned two years old and others are only one year old so we won’t be overrun with anything. Still, it’ll be nice to get a small sampling from most. Fruit trees are most definitely not instant gratification. The tomatoes are finally starting to take off, no thanks to all of the gloomy weather we’ve had this spring. The furthest row out, however, has had a rough start and I’ve had to replace several a couple of times. The birds just love that row because they can swoop in and cause all sorts of death & dismemberment! I finally got the strings up on Tomato Henge in hopes of slowing them down — and it seems to be working for the most part. The pepper are sulking. It’s just been too roller coaster-y a spring for them and I don’t hold out much hope for good production. Yet, there’s always hope… The lettuces are even growing slowly. I’ve never seen lettuce grow so slowly!! Beans still haven’t been planted as I’m still waiting on Steve to get my bean trellis back up. He’s done about half of it and will get to the rest this week some time. The bees? The bees are doing well! I’m so excited about the bees this year! That split I did about a month ago has done really well — both halves. The packages are coming along as they should. The nuc I bought from Bernie last month is doing great. I also caught two swarms a few weeks ago. One died out, as it was just some left-behind straggling rejects, I assume left behind when the main colony took off to find new quarters. They were in a bee tree that was knocked over & split during some pasture clean up and had been rained on — downpoured on — a few days. We brought them home anyway with no hopes of them making it so we were not disappointed when I found them all dead as a doornail a few days later. The second swarm was from a construction site, landed in a precarious spot that was not at all fun to get. I was pretty sure I got the queen but things were crazy so maybe not. Last I checked on them (a few days ago), they were still there! I took a tip from a friend and put a frame of brood (from another hive) in with them to entice them to stay. It seems to have worked so yay for that! There is not a huge quantity of bees, though, so it remains to be seen whether or not they’ll make it. I plan on getting in the hives again in a couple of days. In the meantime, I’ve been building more frames because the five good, strong hives are mostly into their third boxes now. And still no sign of mites on any of them! I know just looking isn’t a surefire way to get mite numbers but I pay very close attention to the drone brood that gets ripped open and have seen nary a one. (I’ve always seen them easily that way before.) Another major boost in my beekeeping confidence is my greatly improved ability to spot queens. I don’t mark my queens so they’re not terribly easy to find at times. I’m getting rambly again, aren’t I? I’m back on the paleo/primal bandwagon and the caffeine/carb/sugar withdrawal is making my brain turn to jelly. Really dumb, unfocused jelly. Thank goodness school is out so I can catch up on outside chores now. Steve even took a three day weekend over Memorial Day and managed to accomplish an amazing amount of things, most notably butchering. We’ve thinned down excess birds and may have to do another couple of dozen. 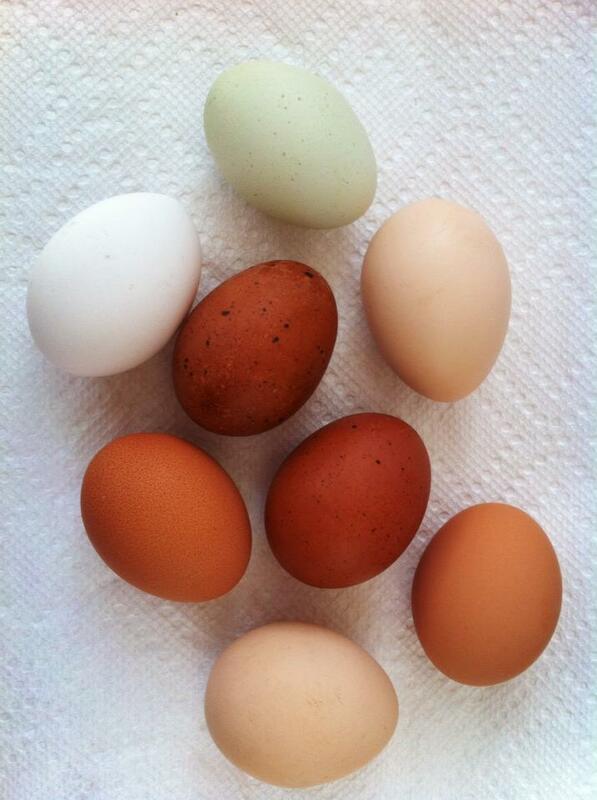 Our laying-age chickens have either stopped laying again or have started eating every single one of their eggs. Not happy. Frankly, at this point, we’re just about ready to butcher them all. Stupid chickens. We do have that new batch of Buff Orpingtons up & coming, along with a couple of Icelandics and maybe another dozen or two dark eggers in the incubators. Maybe we’ll have better luck with this fresh batch. The garden is coming along well. The no till, deep mulch method is finally showing some results here. Where we’ve done well with good mulching, it’s fairly easy to pull the occasional weeds out by hand and moisture is moderated by the chips. When it’s too soggy out, the chips absorb the excess. When it’s dry out, the chips release some moisture. It’s a good thing. Each year, we expand the well-chipped area a bit more and, eventually, we’ll have the entire main garden done up nicely. I planted cucumbers out this morning and, yesterday, planted muskmelon and watermelon in the boys’ front beds. 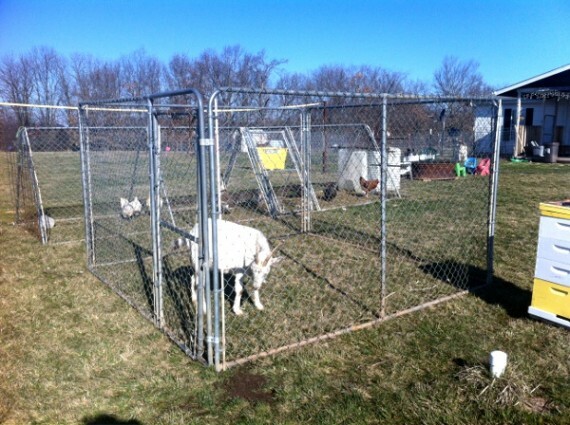 The goats found a new way out of the fence three days in a row. I think we’ve finally fixed that but not before they ate down all of the blackberries and strawberries in the boys’ beds. At least they didn’t touch the tomatoes up there or anything in the back gardens. 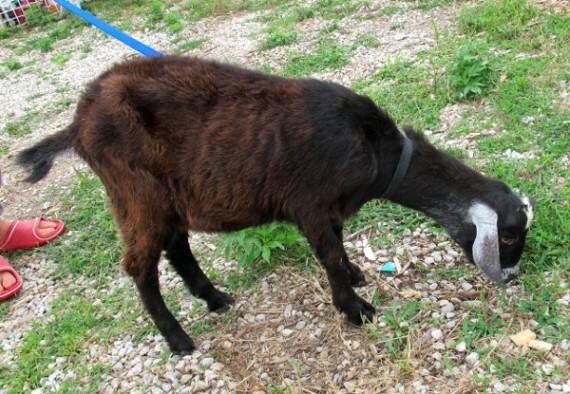 Speaking of goats, Steve finally got a chance to redo the goat fence on the driveway side. It had always been there as a “temporary” thing but you know how that goes. Times gets away from you and it’s still there a year later… Anyway, he got up the smaller, tighter version of it around the shed so we can use that for separating babies from the mamas in order to milk. Cody and I will work on taking down the rest of the leftover temporary fence this week. 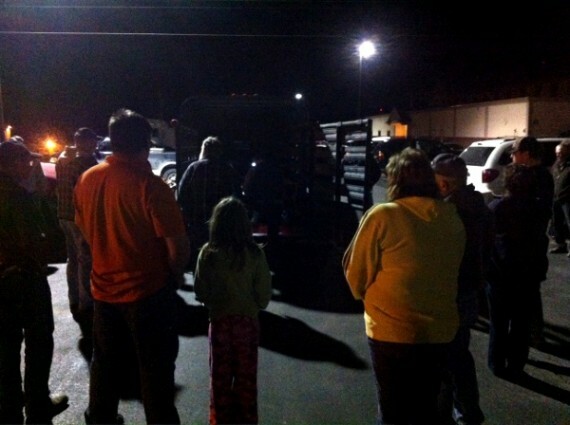 Then we can get back to piling wood chips there and parking the trailer, etc, in that spot. The driveway has been pretty crowded lately! Maisy & Missy have still not kidded. Dorks. I know they’re pregnant but, dang, how long can a goat be pregnant for? We got Susie’s bucklings disbudded the other day. And, by “we”, I mean Steve. I was out there “helping” by holding their heads still while Steve took the disbudding iron to them but it didn’t take long for him to tell me to just go in the house. Apparently, my “helping” wasn’t terribly helpful. Might have had something to do with the fact that I was turning green and looking like I was going to have a nervous breakdown any second. Strawberries! We harvested the first strawberries and, man, are they good! We picked nearly a gallon last night but only half of them made it into the house. This morning, the girls went out and picked another (almost) half gallon. Of course, their standards for ripeness are a bit lower than mine. The bees are doing well. I caught a tiny swarm a while back (did I already mention that?) but it didn’t make it. Do you know that I’ve never, ever had a swarm stay and/or make it? Ever. Except that package last year that tried to leave and we caught it in our yard but that’s not really a swarm. That’s just absconding. Anyway, the packaged bees are doing well and have their second brood boxes on. The overwintered hive that we split into two are both doing well. And that nuc I was supposed to pick up from Bernie? It’s the best thing ever! 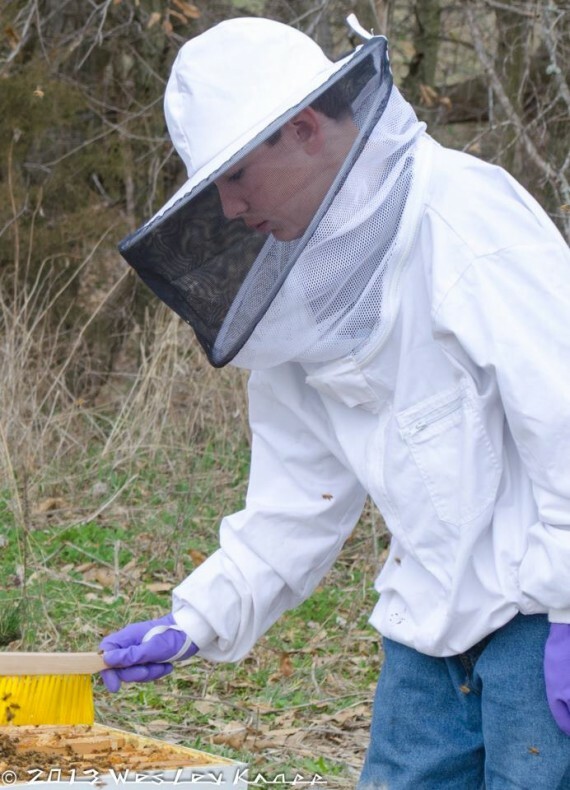 I need to get out there and check all of the hives again but, dang, this stupid weather just isn’t cooperating. I’m hoping after this next round of storms passes, I’ll have clear day or two to get out there and do some digging. I won’t dig through the splits until it’s been over a month, though. That’ll be another couple of weeks. And did I mention Nellie having the Best Birthday Ever? Grandma came out one weekend and a giant pile of friends came out the next weekend so she had two parties! She got a pink, sparkly bike as her gift and has been riding it practically nonstop since. Well, as nonstop as you can get with all of the stinking rain we’ve had lately. Okay, that’s it for today. I’ve missed a bunch of happenings I wanted to note here because I keep waiting for the “perfect time” to sit down to type it out. Unfortunately, too much life happens in between the perfect times for me to keep up. Doh. I need to accept the imperfect, as disjointed as the results may be. <— Life lesson for today. And every day. Most exciting is that Susie, one of our Kinder does, had quads!! They’re all bucklings which kind of stinks but I think we should be able to find homes for them. We are allowing Nellie to keep one as a wether since it’s her first batch of babies. The others will be sold as either bucklings or wethers, depending on the interest. I’ll get some pics of each one and post them on a for-sale page in the next few days. One of them is much bigger than the others and came out ready to take on the world. Two were born with good strength. Those three are all nursing well on Susie. The fourth was the runt and weak. Nellie has named him “Band” because of a white band around his belly. We are having to bottle feed him but he’s doing pretty well. I think Band is the one she’ll end up keeping since he’ll be so attached to her from the bottle feeding. Those dozen Icelandic chicken eggs I got in the mail and put in the incubator? Only two hatched out. The lady I bought them from packaged them very, very well so it’s not her fault. The box was labeled “handle carefully”, “fragile”, and “live embryos”. I’m imagining some disgruntled postal employee taking out his frustrations on my eggs and scrambling them. 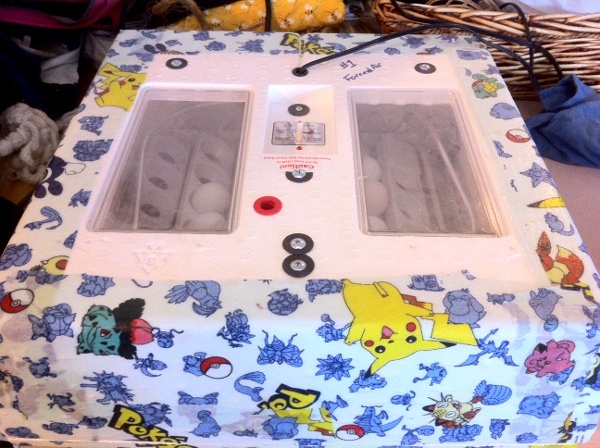 In the incubator now are a couple dozen guinea eggs, seven Red Bourbon turkeyssssss eggs, and 17-ish chicken eggs. There are a couple of pretty green ones but the rest are a beautiful deep brown. We have one chicken — and we still don’t know which one it is — that started laying this year, the dark egg pictured below. It’s such a gorgeous color, I’m hatching some out to see if I can get some more dark-laying girls. Of course, most probably won’t lay that color but I’ll see if I can keep a couple of them going. The garden… Oh, boy. I got all of those wonderful tomato and sweet pepper seedlings from my friends over at Terripin Farms. After studying the forecast, I decided it was time to plant out the tomatoes. Ha. The night before last, May 11/12th, we got a nice, thick coat of frost. It’s not pretty. I’m giving them a few days to see how many of them can shake it off and regrow but then I’ll have to start hitting up the farm stores to buy replacements and replanting. Yay. The pepper plants were brought inside as I know better than to plant them out that early but, last night, temps got down to 39-ish and they were not brought inside. I was getting kids in bed and asked Cody to bring them in for me. Well, he forgot and I just assumed he did it. Crap. They’re alive but peppers exposed to temps that cold are generally not very productive, ever. I don’t yet know what I’m going to do about the peppers. Maybe I’ll just plant them anyway and treasure what I do get out of them. Other than that, the lettuces are doing well and we should be overrun with it in a few short weeks. Neighbors, beware! I’ll be hanging bags of lettuce on doorknobs every other day. I’m not sure what’s going to happen with the fruit trees this year. We’ve had a couple of frosts after they’d blossomed and/or set fruit. I guess it’s another wait & see deal. At least our trees are still young and we were not expecting a whole lot out of them yet. I have progressed further along my “Holistic Orchard” road, planting (clearanced cheap!) daffodils, lambs ears, and that sort of thing in the mulch around the trees. I’m going to work on planting some comfrey and walking onions under them this week, along with some (also clearanced cheap!) hostas I snagged from the frostbite damaged table at the farm store a few days ago. Bees! Last week, Tracy (a friend of mine and new beekeeper) and I went over to Janet’s (a fellow beekeeper at the same level as me) house. Janet has three hives — three very strong hives that overwintered. We went through them all, trying to decide which one to split because she only had enough extra equipment for one more. One hive was huge and had lots of queen cells. The smallest hive was looking good but still had a few frames to fill and was perfect for putting supers on. The middle one looked, to me, textbook ready for a split. So that’s what we did. We did an even split, dealt like a deck of cards, ala Michael Bush. I really think they’ll do well but only time will tell. Then, this week, the gals came over to my house. Friday, we went through my hives. The packages are looking good with brood and stores in each but were not yet ready for a second box. One of them might be ready this week so I’ll be sure to check them soon. We did notice supersedure cells on both of the packaged bees so I take it they didn’t like their queens. I’ve read that it’s fairly common in packaged bees. We spotted the queen in one of them — a big, beautiful girl! And we saw some bees with droplets of nectar on a back leg, transporting it somewhere. That was pretty cool to see but I’ll have to do some reading to find out what’s behind that particular activity. I have trouble spotting eggs. As in, I don’t know if I’ve ever seen eggs in my own hives. That’s pretty bad. I know there are eggs because there’s brood every time. I just can’t see the suckers. 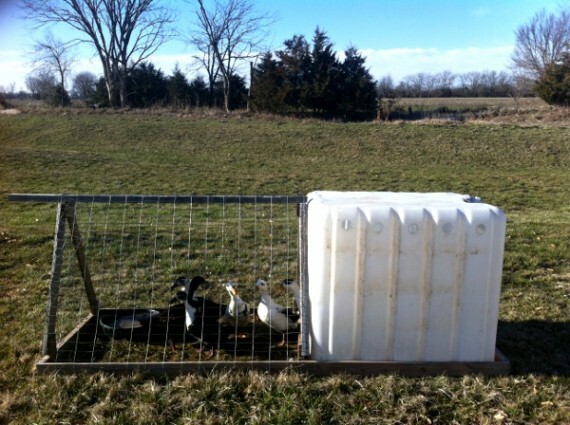 If I can get to where I can spot eggs, I’d like to make some nuc boxes up and then start making nucs myself next year. Anyone know the secret to spotting eggs?? Oh, I ordered a nuc! We’re pretty excited about it since we’ve only had packaged bees, swarms, and cutouts before. We should be picking up any day, I think. This will put us up to five hives if that split takes. That gives us some much-needed buffer for losses. That reminds me: We saw no mites whatsoever on my hives. Very cool! I know they’re still there but at least the levels aren’t so high that they are easily seen, as we did at Janet’s. I was looking pretty hard at the drone comb and saw nary a one. I think I’ll get out there and do an alcohol wash once the splits have had a chance to get going and see what the mite count is. Porch Chickens, Chicquariums, Violas, and Pokebators. I dare you to find another title on the internet like that. So last night was our big, end-of-year homeschool shindig. The kids sang and played music for us and we got to look at all of their artwork. Now I have not a single artistic bone in my body so I’m am always downright amazed at the things accomplished! And the teachers? I’m pretty sure they’re the most amazing women on the planet, always coming up with new ideas and then actually herding the kids in the proper artistic direction while still allowing them to do their own thang. I have no idea how they do it. I was completely skipped over when that mommy gene was handed out. Me no grok. So how do I contribute to the homeschool coop? Ah, see, my great talent is sitting in the nursery doing nothing but watching some really stinking cute young kids for a couple of hours each week. That’s it. I sit. I flap my jaws at a friend who is in there with me. I giggle at the kids’ antics. And that’s it. So what does one of these amazing superwoman teachers do? She bought each of her kids’ teachers a big, ol’ potted plant with gorgeous flowers. And she bought on for me, too. Can you believe that? I’m still in shock — in a good way. It completely made my day. She does all of these great things for & with my kids and she bought me a flowery gift. I’m a loser and never think of doing thoughtful things like that — but I’m a happy, grinning, giddy loser. 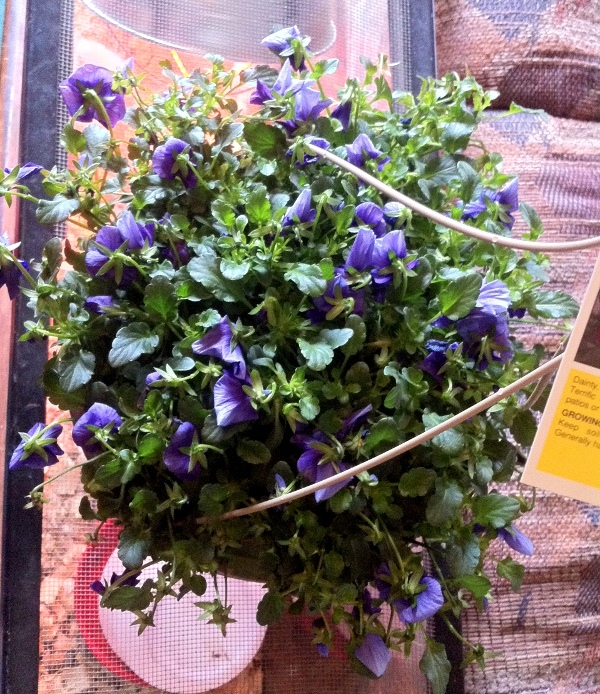 I LOVE my flowers and will get warm fuzzies forevermore when I gaze upon them. Once it warms up, I think I’ll hang them on my front porch. Violas. I know nothing about them, other than I love, love, love looking at them. I’ve always wanted some! I’ll have to do some reading up on their care so I don’t kill them. Wait a minute… What is that the violas are sitting on? Hmmm…. Yeah, you caught me. 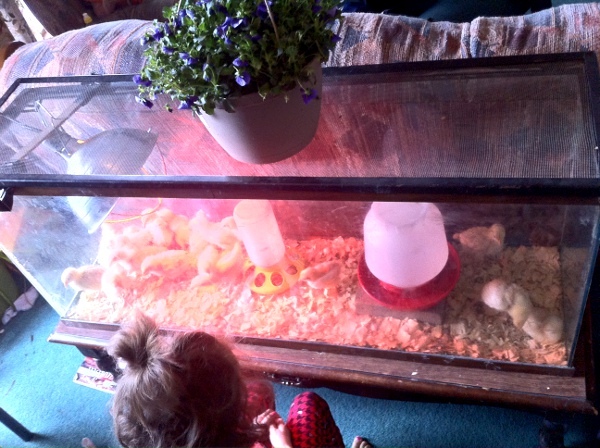 I bought chicks. I happened to be in the feed store yesterday and noticed they were clearancing out their chicks. Bam. Ten Buff Orpingtons hopped in my cart through no fault of my own. Once I managed to break the news to Steve, he weakened and suggested we might go back after the kids’ concert and see what was left. Bam. Eleven more Buff Orpingtons jumped into our cart, through no fault of my own. So we’re now the proud owners of 21 Buff Orpingtons, supposedly all pullets. Because we don’t have enough birds. Which is why I also fired up the Pokebator. Fifteen Icelandics are working their way towards hatching. Birds are cool and you can’t have too many. 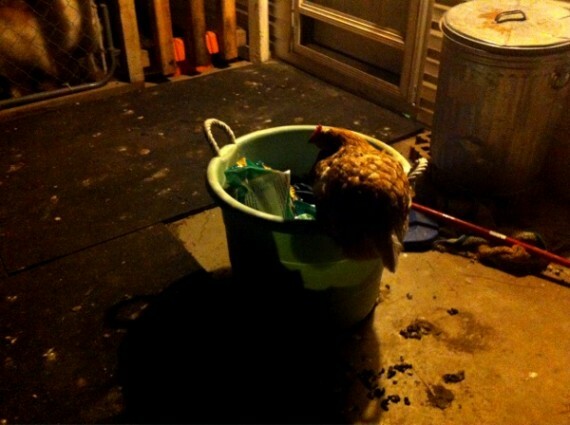 If you’re lucky, you, too, might end up with a Porch Chicken. That one bird who flaps to her own beat, refusing to go into the coop each night. Instead, she perches on random crap you leave on your porch. And poops. All night long. Then you’re forced to leave the piles of crap on the porch because, if you move it, she’ll have no place to roost. And then the other birds that still free range, during the day, figure that the porch must be quite the cool place to be and decide to hang out there as well. Pooping all day long. And people have this romantic idea of free range birds. Ha, I say. Ha. I composed this post on Tuesday but, apparently, I hit “save draft” instead of “publish” so it never got sent out. Oops. Thanks to Duke for pointing it out to me (and reading over my shoulder when I’m typing even though he knows it drives me crazy!). ‘Tis the crazy season. On the bright side, that means it’s spring! And, good gravy, has it really been three weeks since I last posted?? I don’t even know where to start. I have a buttload backup of pics to upload for you but I think, for today, I’ll just do a quick catch up on what’s been going on and then work on putting up pics bit by bit over this week. In the garden, not much has been happening. It’s been cold and wet and, well, nothing much has been done. I still haven’t planted out the onions that arrived back in March. I’m not even sure they’d do anything at this point. They’re probably mostly dead. I’m a bad onion mommy this year! I did get a bed of lettuce planted, however, and it should be up by now but I’ve not been back that way to look for a few days. Also, a friend, Patty, let me come over and dig up a giant load of her thornless blackberries. Yay! We already had a few but they met with some misfortune not long after planting and haven’t done terribly well. The new ones have been planted in front yard beds where I can keep an eye on them and dig up starts to plant elsewhere and/or share each year. While planting the lettuce, I did notice the raspberries are coming up with new starts like crazy. I’m very excited about that! We love berries very, very much. The birds are all doing well. We’ve started getting turkey eggs and, after giving the mailman a few to try (we have the greatest mailman in the world! ), we’re saving them up for hatching. Maybe I won’t kill them all off this year, huh? Heh. The tractors are serving their purpose well. Nothing in tractors been killed but I think a few of the still-loose chickens have been offed. (Besides the usual suspects, we now have a bobcat on the scene. It was over in the treeline a few nights back, snarling like a demon.) 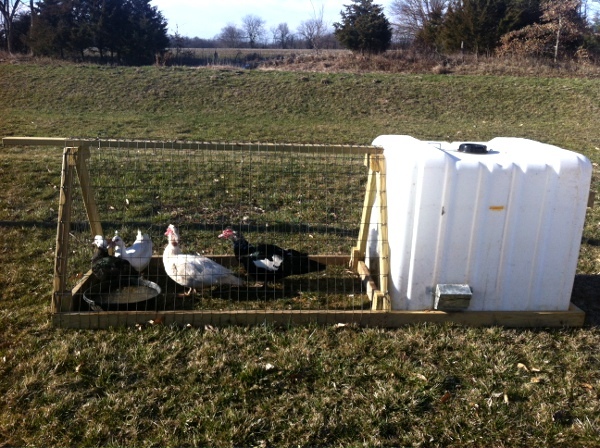 The chickens and ducks are all starting to lay full speed ahead now. We’ll soon be buried in eggs. Oh, and I have 15 Icelandic hatching eggs in the incubator! I’m so excited about the Icies and can’t wait to see how they do for us! They’re due to hatch the second week of May. We’re now entering our big kidding season. ShowTime, our beautiful black Kinder, kidded one very beautifully colored doeling a few days ago. She had a defect in her eye and was terribly weak. ShowTime rejected her so we brought the doeling, named Redeye, in the house to warm up and feed. Unfortunately, she died that evening. I’m now milking ShowTime three or so times each day. She’s a first freshener so I’m training her to the milkstand and working with little itty bitty teats. Fun. I got a couple of ice cube trays of colostrum put back in the freezer for my trouble in case we need it down the road. And now her milk has come in, she’s putting out quite a bit of milk considering. I think next year, she’ll be a great milker. Other than the tiny, first-timer teats and being impatient on the milkstand as she trains, she milks out very easily. We still have three does left to pop — Susie (who is HUGE! ), Maisy, and Missy, all Kinders. Susie is an experienced mom but Maisy and Missy are both first fresheners. Hopefully, we’ll have no more troubles. I got to go a sheep & goat class offered by the local adult ag program. This was a month or two back and was nothing earth-shattering but I learned quite a bit. The main thing that struck me is what the fella said about timing kidding in relationship to worm loads. 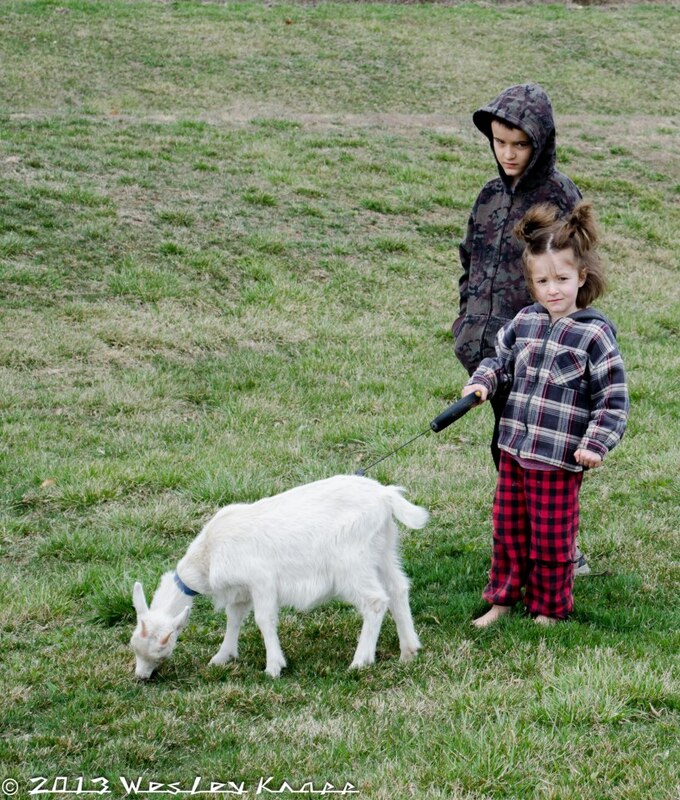 In a nutshell, kids who are born early (in winter), stand a much better chance at parasite resistance. They are born before worm loads are high and get exposed to them very gradually, building up resistance and, by the time worm loads are high, in summer, they stand a good chance against them. On the other hand, kids born in spring and summer never get that same chance to gradually build up that same resistance. They are born when parasite loads are at their highest (or soon before). It’s like being born in the middle of a very active battlefield. They are never as healthy, for the rest of their lives, as the early born kids. Very interesting, don’t you think? I’d never thought of it from that angle, only from the “Brrr, it’s too cold in winter to mess with kidding!” angle. And bees! We picked up our two packages of bees the first week of April. The install went smoothly and, miracle of miracles, they’re still there! 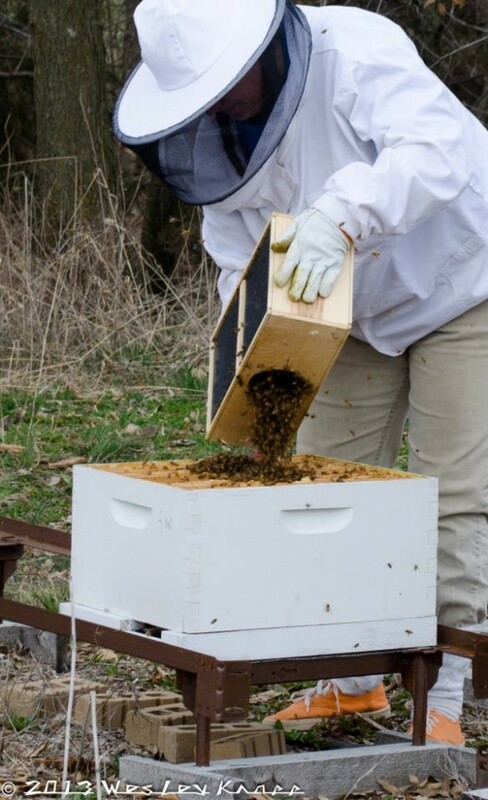 I inspected the hives again yesterday and saw plenty of brood, larvae, pollen, and nectar. They look like happy bees. This year, due to just using what was handiest to grab, both packages went into deep bodies with already drawn out foundation. I’ll work on switching them to foundationless mediums as I can. The old hive that overwintered is also doing well. It’s currently in two medium boxes with a mix of foundation and foundationless. I’m really, really hoping to be able to do a split from them at some point this spring. Th-th-that’s all, folks. At least as far as a quickie overview. We’ve been hit with two separate varieties of crud over the past month and Josie is still sick. The poor thing climbed up on my lap after I started typing so this will have to suffice for now. Needless to say, we left the installation for the following day. It went smoothly and, very lucky for us, we had some friends over to document the day. Rhonda and Wesley, her talented photographer husband, wanted to see how it all went down. We also had some neighbors from up the road come over. Three sisters who are in 4-H and just getting ready to begin their beekeeping journey. A huge thank you to Wes for sharing his beautiful photos with me and another thanks to the girls for allowing me to post their faces here! Charlie showing the bees who’s boss. We pulled the remaining honey from the deadout hive. Most of it went into the other hives but we snuck two frames into the house and harvested. Yummy, dark honey — my favorite! Of course, the bees weren’t the only ones getting extra attention that day. How stinking cute is she?!?! Again, thanks to Wes for braving the bees to take these photos and then sharing them!! We’re still working on getting tractors built for the rest of the birds but we’re gaining on it. We also started putting together tractors for the goats so we can move them around the yard easily. Here’s the first goat tractor, holding Blue Cotton and her two doelings. Like good rednecks, we stuck it smack in the middle of the front yard to begin. 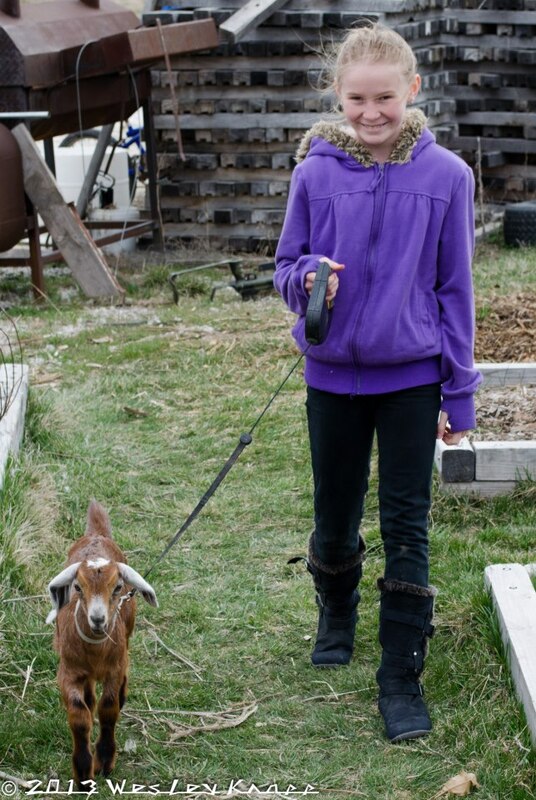 That pen contraption just beyond the goat tractor? 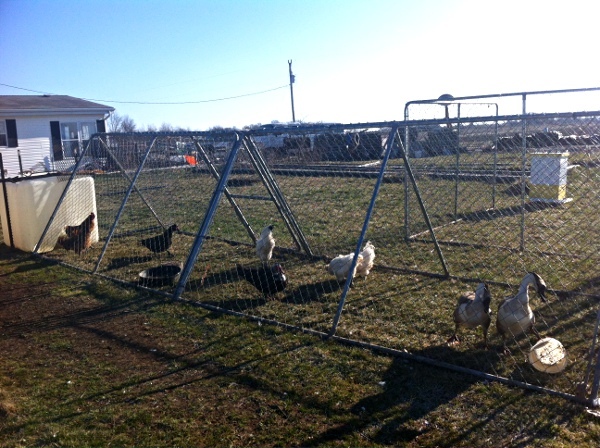 That’s our temporary holding pen, where we are putting birds we no longer want as we sort through this spring’s poultry assortment. We’re holding some for our friend,Hollie, but the rest will go to freezer camp. Hollie, I know you want the two geese. Right now, there are five roosters in there — which ones would you like me to hold for you? Once we kill off the excess roosters, we’ll start putting hens and ducks in there for you. Then our Ancona collection — six ducks and one drake. We’ll probably add another drake to the mix and divide them into two tractors once we get more built. And, lastly, the two breeding pairs of Muscovies who will also be divided once more tractors are finished. One more large tractor is providing current housing for our pregnant sow. The rest of our poultry are still in the back pen which also includes my garden right now. Steve’s going into hyper-build mode right now so we can get the rest of the birds out of there and I can start planting! I don’t know if all of these tractors will end up being a permanent thing but it sure is handy right now! They’re so easily moved around to fresh patches of grass & bugs, keeping up rotational grazing/browsing, lowering worm & other pest loads, I’m thinking we’ll always have at least a few tractors. 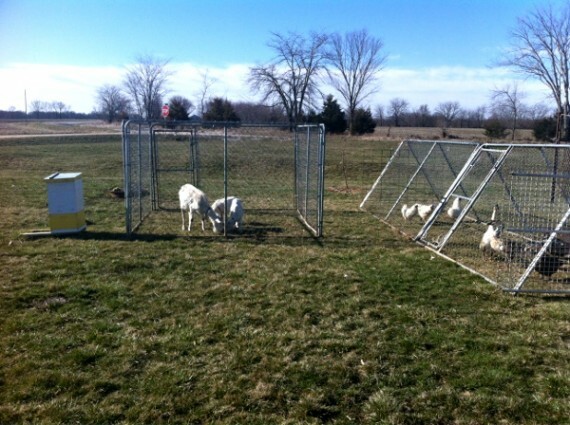 If we keep a good portion of the critters tractored in the spring & summer, that gives the big pens a chance to rest and regrow for fall/winter as well. As always, there will be more tweaking as we go along.